Tony reported that the group was now in its 30th year. He thanked members of the committee for their work over the past year and was pleased that the inaugural Mardale Magic had been successful. Tony will continue to oversee the group’s website. As part of the Hadrian Hundred 2019 organising committee, he made a request for helpers for the baggage detail at Dufton, which involves working through the night. Cumbria LDWA has agreed to co-ordinate this task and Tony would appreciate an early indication of numbers of helpers from the group. Roger, Jim, Martyn, Clare, Pat, Dave, Andy and Louise agreed to help. Louise reported that the past year had seen a varied programme of walks, however the highlight of the year had to be the successful Mardale Magic challenge event, successor to the Three Rings of Shap, which has put Cumbria LDWA back into the challenge event scene. She reported that membership numbers had not changed significantly from 2016, with a list of 34 people involved either occasionally or regularly with the group and a core of c. 15 regular walkers. For the first time, Louise will be attending the Local Groups week end, which this year is being held in Hawes from 9th-11th November. She will provide feedback to the group. She thanked the committee members for their support and Neil in particular for all his hard work in staging Mardale Magic. Andy gave an overview of the past year’s ten group social walks, giving details of leaders, location and attendance. He produced a summary of walk leaders; Neil and Martyn having led the highest number of walks over the past two years. The 2016-2017 social walks have covered 185 miles in total, with an average distance of 18.5 miles and an average attendance of 9 members. Andy thanked the leaders for the past year and made a request for leaders from May 2018 onwards. Jim reported a balance of £1651.50; an increase of £170.06 from last year’s balance of £1481.44. This was the profit from Mardale Magic and £8.00 from the sale of Helm Wind badges. Discussion took place regarding suitable organisations to which we could make a donation. In the past this has included all the Mountain Rescue teams in and around North Lakeland. Dave suggested the Great North Air Ambulance Service (GNAAS) as a worthy cause and gave examples of their vital work, particularly within the outdoor community. Jim suggested that we keep the donation at £50 for this year, in order for the group to build financial reserves. It was agreed to review the donation amount next year, following the staging of Mardale Magic. It was agreed to donate £50 this year to the GNAAS from group funds. He has all the Group equipment in storage, some of which was used for Mardale Magic. All the current officers were prepared to stand for another year and were re-elected unanimously. Neil reported that in the aftermath of the event, there was some encouraging feedback from participants and he cited some examples. The challenging weather conditions had not deterred entrants and there was high praise for the checkpoint marshals in providing support in spite of the conditions. Neil stated that he is prepared to manage the event again in 2018 and suggested a date of Saturday 29th September. Jim suggested that parking will not be possible on the cricket field at that time of year, therefore parking could be problematic if the number of entrants increases significantly. Paul is standing down as the Helm Wind Walk Recorder. Andy agreed to take the role on and Tony agreed to arrange for the LDWA website (Anytime Challenges section) to be updated. Paul reported that there are c. 15 badges left and will pass these to Andy. Paul will also supply Andy with a route description. Tony thanked Andy for taking on the role. Louise enquired whether any member would be interested in arranging an away trip for the group for 2018. Jim suggested that he had details of suitable accommodation in Shropshire and would supply details to anyone prepared to organise a trip. Tony suggested that if anyone wishes to pursue this, they should contact Louise. Paul expressed regret at not being able to assist on the day for Mardale Magic. The next AGM will take place on Sunday 21st October at the Oddfellows Arms, Caldbeck. Welcome again to what is, I believe, the start of our 30th year in existence. I have only been a member of the Group for half of this time so for details of events prior to that you will have to consult more senior members. As befits the role of Chairman I have little to report - thus following faithfully in the footsteps of my predecessor. For various reasons I have not walked with the Group this year until today but I am sure we will soon learn more about the interesting monthly walks which have been enjoyed. I would like to thank Louise for continuing with the Group Secretary’s role and for organising this evening so well. Thanks also to the other Committee members for their work and commitment over the last year. Jim continues to look after our financial health and Andy continues to organise our monthly walk with aplomb. Neil ably introduced the first edition of Mardale Magic – a worthy successor to the Three Rings. Despite some early worries about numbers he delivered a successful Event despite the appalling weather. I don’t wish to steal his thunder here so suffice it to say that the Treasurer is still smiling! I am happy to continue to look after the group’s website and to input Walk reports and other items as necessary. Finally it is worth mentioning that I am on the Organising Committee of the Hadrian Hundred which will be delivered by our neighbours in Northumbria in May 2019. This is obviously a major project and our Group has agreed to run the baggage detail at Dufton. As this an overnight shift we will require a good turnout from members so please put it in your diaries in due course. It would be useful to have an indication as to how many here would be interested in helping. 2017 has again seen a varied programme of walks, taking advantage of the many beautiful landscapes which we are so fortunate to have on our doorstep. In addition the walks have encompassed diverse points of interest, including railway and industrial heritage, Roman remains and opportunities for hill bagging. We have been joined on some of the walks by visitors from other groups; it is good that our walks attract fellow LDWA members and we meet people from different areas. We’ll hear more from Andy, regarding the walks programme for the past year. The highlight of 2017, however, was the successful Mardale Magic event, successor to the Three Rings of Shap, which has put Cumbria LDWA back on the map! Following on from the discussion at last year’s AGM, which provided the committee with much food for thought, the proposal to run a more modest day event was taken forward. The challenge event hiatus last year provided time and space to reflect on what Cumbria LDWA, as a small group could realistically offer. By the end of the year, Mardale Magic was born. It was excellent that so many of the group were able to assist on the day and we look forward to building upon this success. For my sins, I was asked to oversee the catering and I would like to thank Clare, Pat, Janet and Margaret for their invaluable assistance with this task. Without their support, it would not have been possible to dish up on the day. We also had a lot of fun in the process, although it might not have seemed like that at the time! Neil will provide a full report of the event later and there will be an opportunity to review and reflect upon it. Membership has not changed significantly from last year. On the LDWA Group Admin site, there are 104 names linked to the Cumbria group, many of whom have not made contact with us. Our group list has 34 members who are involved with the group on a regular or occasional basis. As last year, we still have the core of about 15 active members. A new departure for me this year is to attend the LDWA Local Groups week end, for Group Secretaries and other committee members. This is an event that Tony has attended on several occasions. This year, the week end will be held over the week end of 9-11 November in Hawes in the Yorkshire Dales. It will involve discussion groups, workshops and a general meeting, which will examine topics relevant to LDWA at both local and national level. Hopefully there will be a walk too! I will provide feedback on this event to the group as a whole. Lastly, thanks are due to Neil for all his work as Event Manager, to make the inaugural Mardale Magic a success. To Andy in his second year as Walks Secretary for ensuring that we are able to offer monthly walks of such variety. Having been in the role, I know that being Walks Secretary can be challenging to say the least; finding willing walk leaders with a Strider deadline never far away. Walk leaders are always required! Thanks also to Jim, who has stood as treasurer for the last five years and who has arranged five excellent Away Trips for the group from 2012-2016 and to Tony, our Chairman, who ably oversees the group’s website, our ‘shop window.’ The future success of the group depends on members being prepared to help out with the running of it. On that note; we are seeking a new treasurer, 2018 Away Trip organiser and Helm Wind Recorder. New opportunities for 2018; here’s to another successful year for Cumbria LDWA. £8 was received for Helm Wind Challenge Walk badge sales this year . A £50 payment was made to Penrith Mountain Rescue. After taking this expenditure into account, our bank balance has increased by £170.06 on last year. 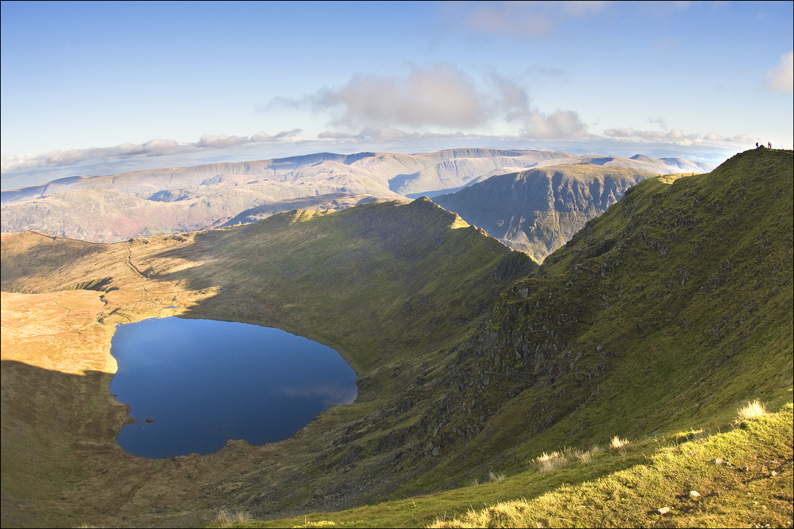 Mardale Magic is Cumbria LDWA’s successor to the Three Rings Of Shap. The inaugural holding of the challenge event took place on Saturday 30 September 2017. It started and finished at Shap Memorial Hall and involved 34.5 km (21.4 miles) and 1,064 metres (3,490 feet) of ascent. From Shap the route was Wet Sleddale Reservoir, Mosedale Beck, Swindale Head, Old Corpse Road, Mardale Head, western shore of Haweswater Reservoir joining Wainwright’s Coast to Coast to return to Shap. There were two checkpoints (Wet Sleddale Reservoir Car Park and Mardale Head) where participants were monitored and timed and offered refreshments. Refreshments were also available at Burnbanks. A hot meal was provided at the finish back at the hall. A warm pleasant day would have been appreciated by all involved in the first running of Mardale Magic. The Weather Gods had other ideas, with incessant rain until after lunch! 64 entrants had signed up for the event but only 46 were present at the mass start at 8:00 a.m. It is a pleasure to report that the event ran smoothly and safely. Feedback from those taking part in the event was very positive. Mardale Magic 2017 returned a profit of £799.00 - £583.80 = £215.20.